Aqua Bay Hotel Free Child Places Tsilivi Zante Family Holidays @Web2travelDeals. Online Since 2000. 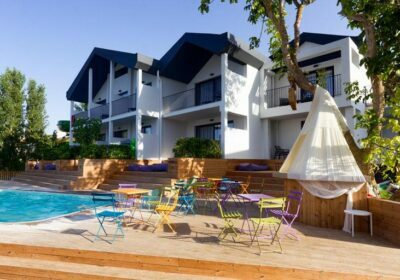 The 5 star Aqua Bay Hotel, Tsilivi is a modern and family friendly place to say, with large family rooms, right next to the waterpark with on-site entertainment and a choice of bars and restaurants. Short walk to the beach. There are 68 hotel rooms comprising 36 standard rooms and 32 family rooms, all with views over the pool or garden. The rooms feature satellite TV, WiFi, a direct dial telephone, a DVD player, a hair dryer, a mini fridge, tea and coffee making facilities, a safe deposit box, an en-suite with a bath or shower and air conditioning. Aqua Bay Hotel has an outdoor swimming pool and sun terrace with bar service, loungers, umbrellas and pool towels. Further leisure facilities and activities include a small fitness centre and mini spa offering massage and beauty treatments. The animation team organise daytime activities and there is regular evening entertainment. Social and dining venues include a buffet restaurant which is open daily for breakfast, lunch and dinner, a lounge bar, a pool-side bar and a themed restaurant open 4 nights a week for Greek, Italian, Mexican and BBQ nights (reservation required). In the neighbouring waterpark there is also an A la Carte restaurant (reservation required), a pool-side bar, a cocktail lounge bar and a snack bar. Amenities and services available to guests include 24 hour reception and free WiFi. There is also an internet corner, bike hire, laundry services and baby sitting (all with local charges).